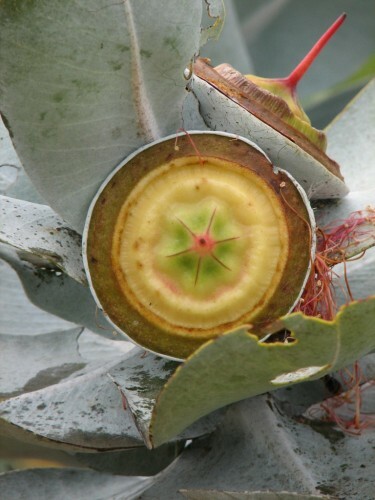 Eucalyptus macrocarpa is a plant from Western Australia and is much valued for its huge dark pinky red flowers and grey- green foliage in floral art work. The gum nuts measure about 3 inches (75mm) across and are also very decorative. When they split to release the seeds, an opening is left which will hold a small candle. With the base levelled off these make a great Christmas decoration. Another reader’s comment would interest Australian plant growers. I rarely ever water the plants and they are very adapted to drought once established. My trees (very shrubby, multibranched, 12ft. (4metres) high) are absolutely beautiful. Although the oldest of my 3 trees is a little more than 20 years old, I know of several in San Diego (about 20 minutes from my house) that are more than 35 years old and I suspect thay live a lot longer than that. More on this plant here. Grevillea robusta is a large tree and grows very well in our dry, highly alkaline soil. At this time of the year it has these fiery orange clusters of ‘spider’ flowers. 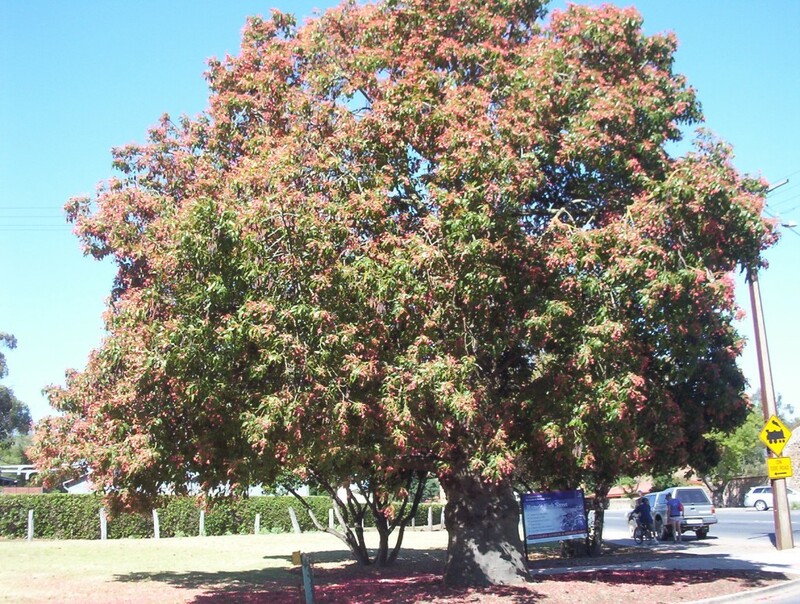 The honey eaters and lorikeets find this a great food source and many complaints are heard of the rowdy birds at dawn and sunset especially. These make good windbreak and screening plants. Many are grown in house yards but as they can be rather large need to be kept away from the house. A general rule is that the tree needs to be as far from the house as the tree’s ultimate height. 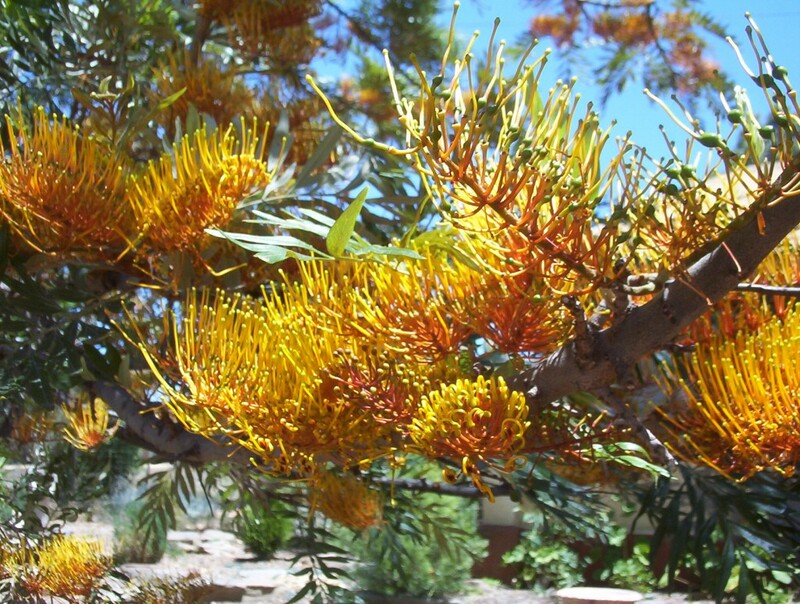 Grevillea robusta is the plant onto which other species of grevillea are grafted. This is one of the Kurrajongs. 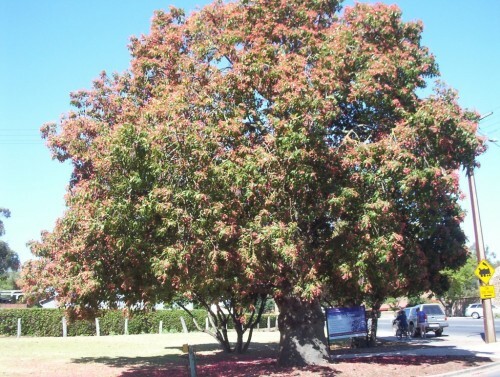 I am not sure of the name as some seem to be lumped under the title Brachychiton diversifolius. 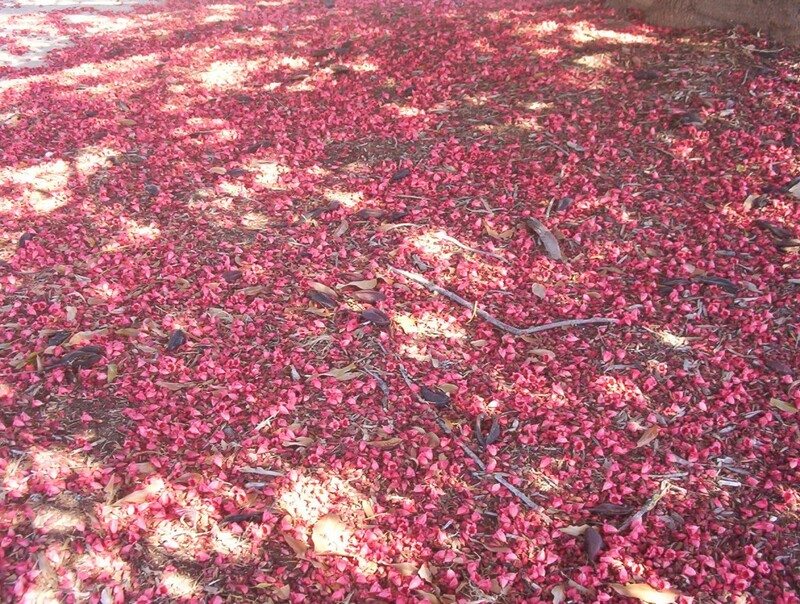 This is the lovely sight at the entrance to a country town near here. The rainfall is a little more and is more reliable. I guess the pH of the soil is less there also which would make a big difference to the growth rate and ultimate size. 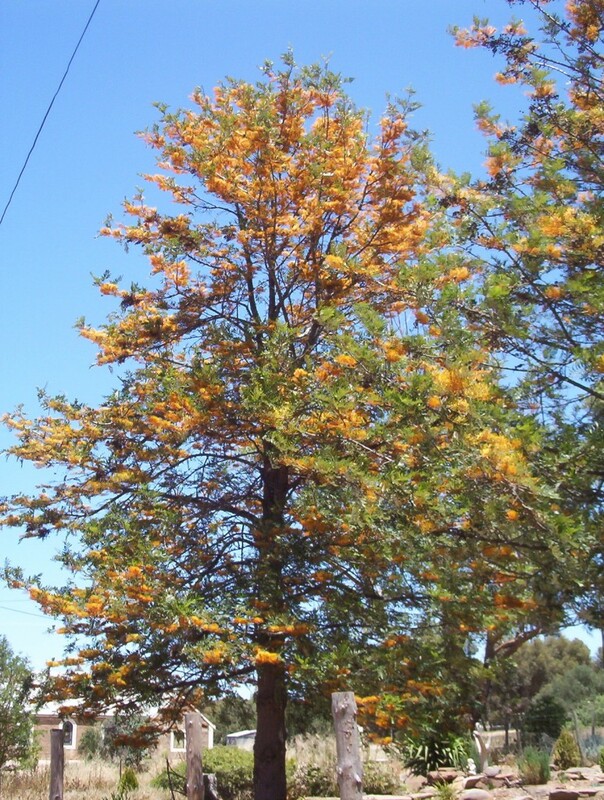 This is a tree of lower rainfall areas and quite harsh summer conditions, appearing in western New South Wales. 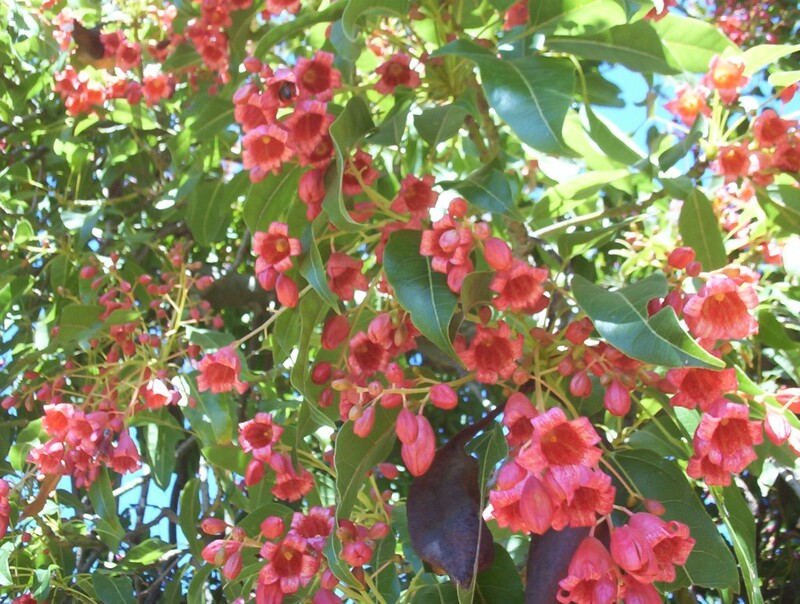 The flowers are like small bells in this delightful bright pink colour, followed by black boat shaped seed pods. 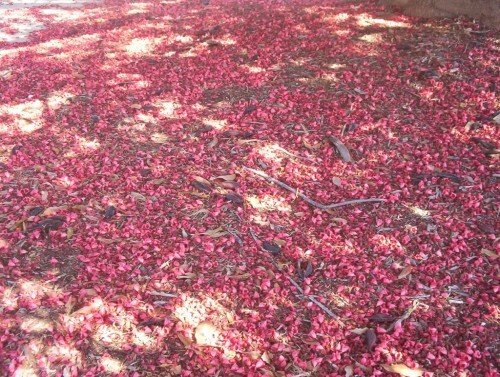 Last week there was a carpet of spent flowers under the canopy of the tree. I was not expecting to see this unusual tree growing in the Australian National Botanic Gardens in Canberra. 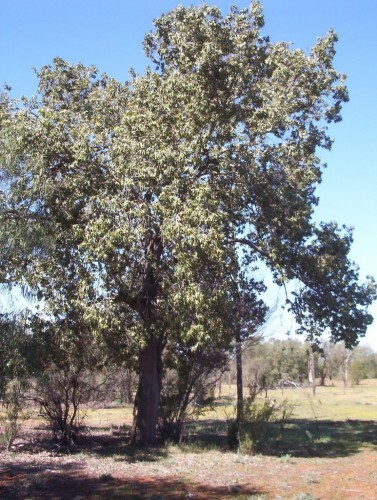 It is a small to medium tree originally from the drier areas of central western Queensland and northern inland New South Wales. 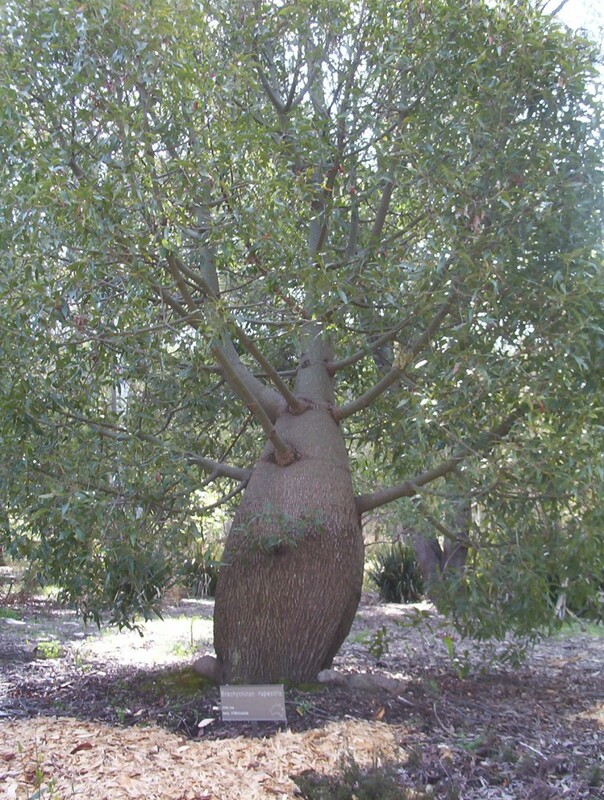 The trunks of the trees are prominently bottle shaped with large specimens having a diameter up to 2m (6 feet). 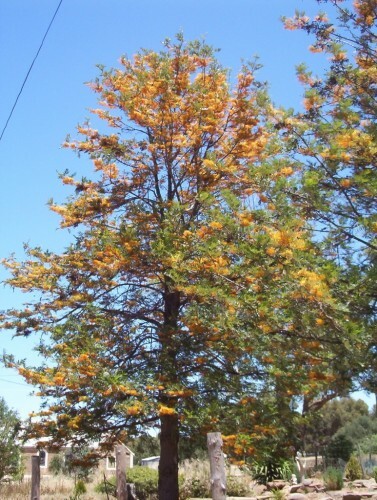 The tree is hardy in most areas once established and of course would appreciate some water during hot dry periods. Young trees are slow growing and make attractive and unusual pot plants for some years. This tree is an important fodder tree for stock during dry periods. The Aborigines ate the young roots and seeds either raw or roasted.